Physical, mental, always with soul. AT HOME. Surely you didn’t think you were going to get a pass did you? Believe it or not gym rats there are tons of fitness channels on YouTube. (Now if you already know this, this post is not for you, but feel free gift this to someone else). I’ve been working out with YouTube folks for maybe 5 years now and enjoy the convenience of rolling out of bed jumping in clothes and getting it in right at home. Any type of workout you want can be found there, strength training, cardio, HIIT, kickboxing you name, as well as the more centering practices of Yoga and Two Chi. So to help some of you nOObs along, here’s the YouTube trainers I currently workout with now as well as some of my tried and true faves. HASFit – Coach Kozak and Claudia are the dynamic duo behind HASFit. They have over 1000 FREE videos on YouTube and a variety of them, HIIT, Cardio, Strength you name it. Kozak usually does the high intensity moves, Claudia the lower intensity. These two are not the “HEY C’MON LET’S GET IT” types, they are quiet assassins. They calmly whoop your tail and you’ll love it. I do most of my strength training with these two, most recently this. BodyFit by Amy – I came upon her by accident, looking for a Kettlebell workout. I had done most of the ones that I like with my old standbys and was looking for somebody, anybody else and Amy fit the bill. She has a wide variety of workouts by type Cardio, Strength etc, but also specialty workouts like her prenatal series. I did one of her prenatal cardio kickboxing workouts on a day when I was really sore and it was great to for getting in some light cardio. I generally do Kettlebell and strength training with her, most recently this. Lumowell – My standing workout schedule includes 3 days of walking per week. Some days, due to work, fatigue and downright laziness I can’t make it out of the bed at 0 dark thirty to go to the gym. Instead of wearing out my carpet with household laps, I looked for walking workouts on YouTube, found a few that were good but a few years old, then Lumowell popped up. I was like whaaattt is this???? Well the trainer is an animated lady or gent (haven’t done one of his yet), with voiceover ques. The exercises are great and include modifications. For the workouts I suggest turning the sound down and using your own music if you like exercising to music. I most recently bumped some House doing this one. Yoga – Yoga by Candace, Fightmaster Yoga, YogaTX, Yoga with Adriene – I’ve been ALL over YouTube trying various Yogis, subscribed and unsubscribed to many, but these 4 I go back to every single time. I can’t tell you why but these are the ones that are best for me and the way I wish to practice right now. Favorite HIITMAN – Millionaire Hoy. This dude is non-stop work, energy and talking! I have never seen anyone do what he does and talk like that at the same time. What I like, is that he doesn’t hide the fact that he’s working as hard as the viewer. Every now and again he’ll let out a little scream which is HEEEEELARIOUS to let you he’s feeling it. I dig him so much and believe in what he’s doing that I joined the BOOM Fist Bump family on his Patreon. MillHoy has incredible HIIT workouts, cardio, targeted body area workouts, themed workouts and as of late a lot more strength training which, if you can tell I’m starting to ALMOST enjoy. Check him out, his energy is contagious even at 5:00 am in the morning. Do you have enough tools now to skip the gym but NOT skip your workout? I hope these resources help and that you find the right trainers for you and your lifestyle. If you have tried any of these folks or would like to make some recommendations, I would love to hear from you in the comments and in all the usual spots. Until next time, enjoy time with your family during the holidays, but don’t forget about yourself, put in that WORK! It was one month to the day from my last run at Rabbit Hill Park. I entered the physical therapy facility on August 14th and completed all exercises, evidently with flying colors. As of now I can participate in all my prior activities with the exception of kettlebell training and running and I’m okay with that. I’m much too skittish about running right now anyway, especially since I’m not completely free of this radicular pain situation. The time off has been good because I learned a few things. It doesn’t take long for my body to get squishy. I stayed begging the therapist to lift because I was already behind the eight ball in my weight training having been focused on Peachtree training since may. A month off from nearly everything and I’m now close to marshmallow material. When my back is up against the wall, compliance is a non-issue. Everything that I was doing or not doing wasn’t working to improve my condition. As it stands with my back in the condition it is in all I can do is what the professionals tell me in order to maintain a good quality of life. I don’t miss the little bit of ego that I did have at all. Though I wasn’t laid up, though I didn’t miss any days of work, I was limited in what I could do. The piece of ego I used to have that said quitting is for whimps is gone. Quitting at least for a while was the best thing I could have done. I never thought I’d miss yoga so much. Having started a 30 day yoga challenge around the time of that last run. I was really looking for to the practice everyday and was making some strides in terms of flexibility and in my overall life outlook. When the therapist sat me down I was like noooooooooooooo!!! Finally, let me say that I’m thankful that I still have a body that tells me when things are going wrong and to keep the going wrong to a minimum I need to listen to my body AND the professionals to stay healthy. Until next time, see you at the gym, the yoga mat and even the trail, where you’ll find me WALKING with a purpose. When I first discovered it about four years ago, it was closed, blocked off and pretty much in shambles. I kept passing by and in 2013 saw that it was being renovated and shaping up to be nothing like that first visit. 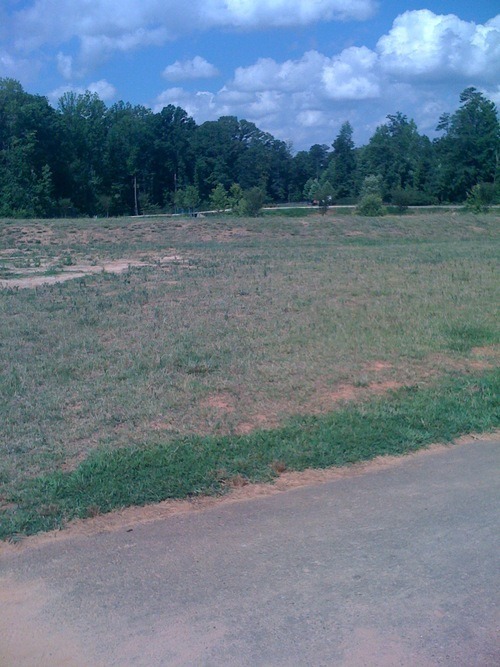 The place had been gutted with signs of life appearing that looked very much like many of Gwinnett’s other great parks. 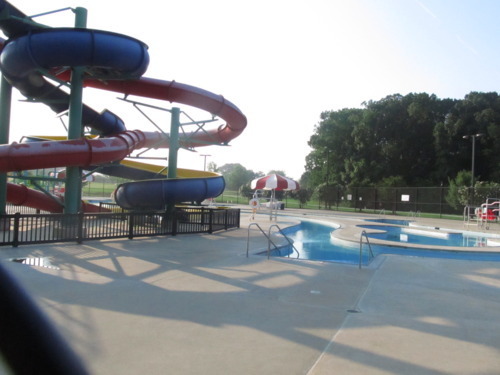 This past weekend, on a quest for the next park to try, I found an article about a re-opening. Woo-hoo! Lion’s Club Park had re-opened so I had to go check it out. 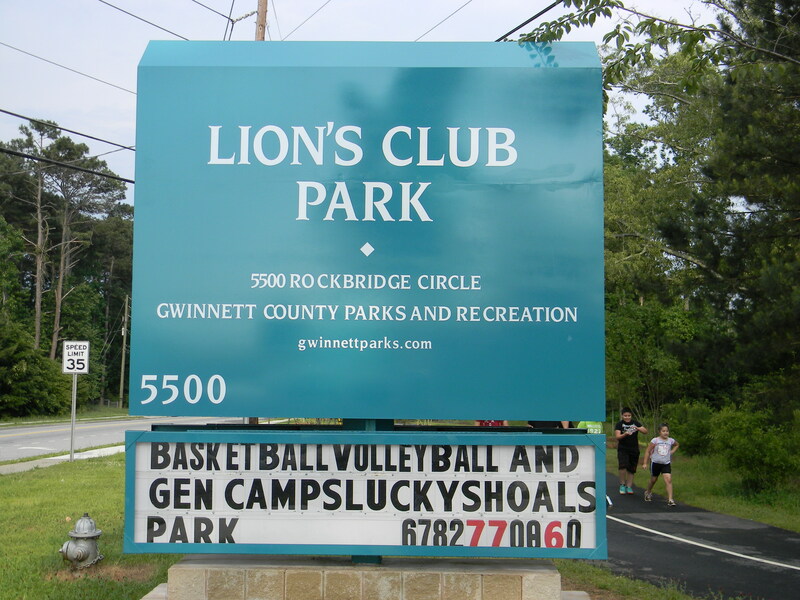 Lion’s Club Park in Lilburn, Georgia received a $5.3 million overhaul and was re-opened in February 2014. 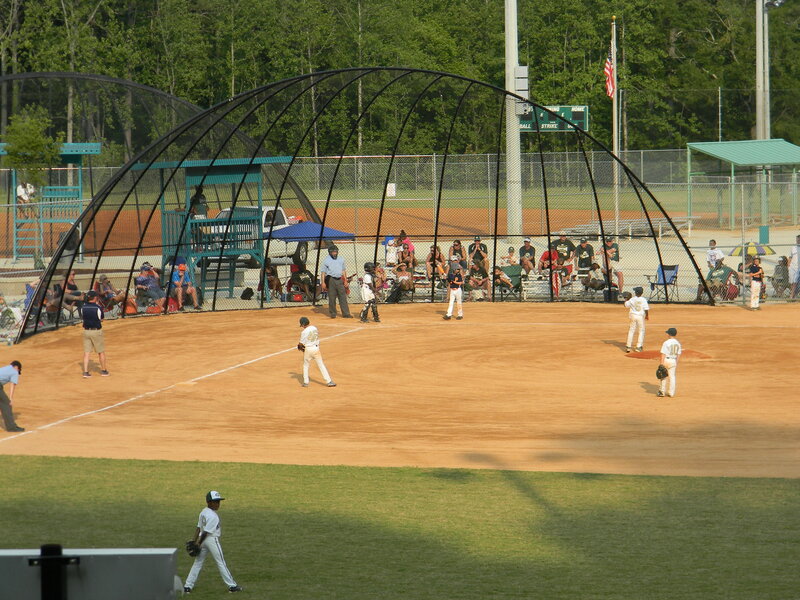 By Memorial weekend 2014, residents were taking full advantage of its amenities which include: a baseball complex with five lighted ball fields, 1,800-square-foot concession/restroom building, plaza, batting cages, 60-foot pavilion area, maintenance building, more than 850 parking spaces, paved trail system with benches, adult swings and shelters. (Amenities listing courtesy of the Gwinnett Daily Post. The county’s website has not been updated as of this writing). 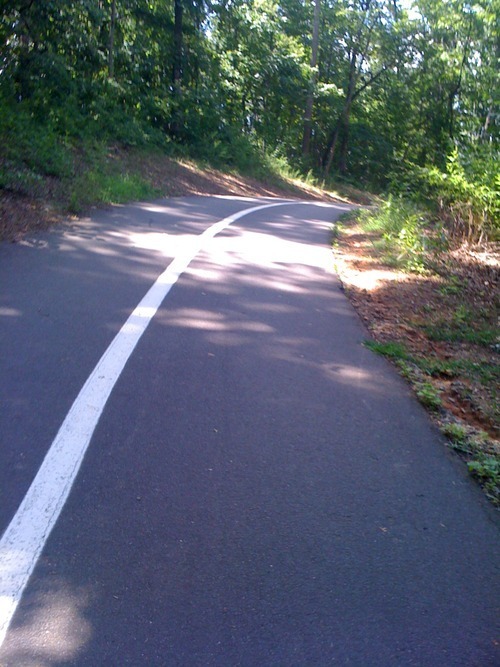 The trail is paved, circles the park and is a short but challenging .77 miles. From the parking area at the main entrance headed toward Rockbridge is all downhill. There’s a brief flat area on the back end near the furthest baseball field and then it’s back uphill to the starting point. 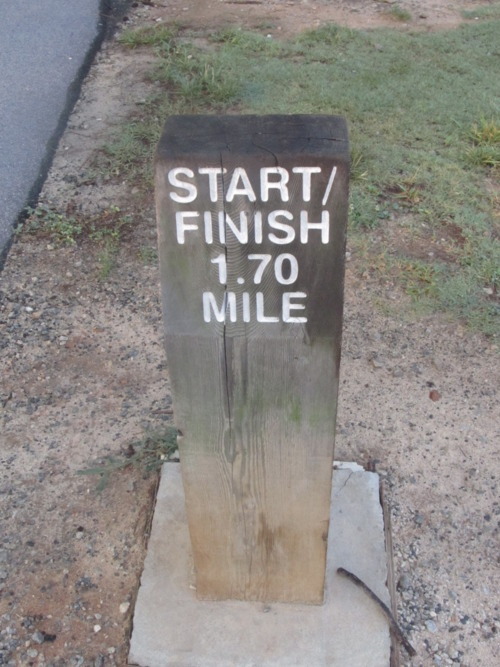 There are no mile markers, which is okay given the distance. 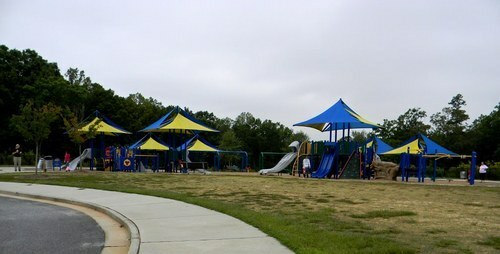 Additionally since this park is basically new, there are mostly new trees, meaning that shade is limited and located in the back of the park by the residential entrance and the front main entrance. Runners, walkers and other sportos should get there EARLY to avoid getting baked. 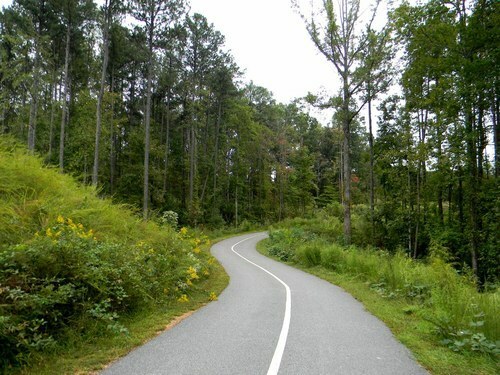 Now if a quick 3 miles is all you want, circle the park 4 times for a near 5K or, at the bottom on Rockbridge stay left at the fork, pass under Rockbridge and enter the Camp Creek Greenway — Glorious! 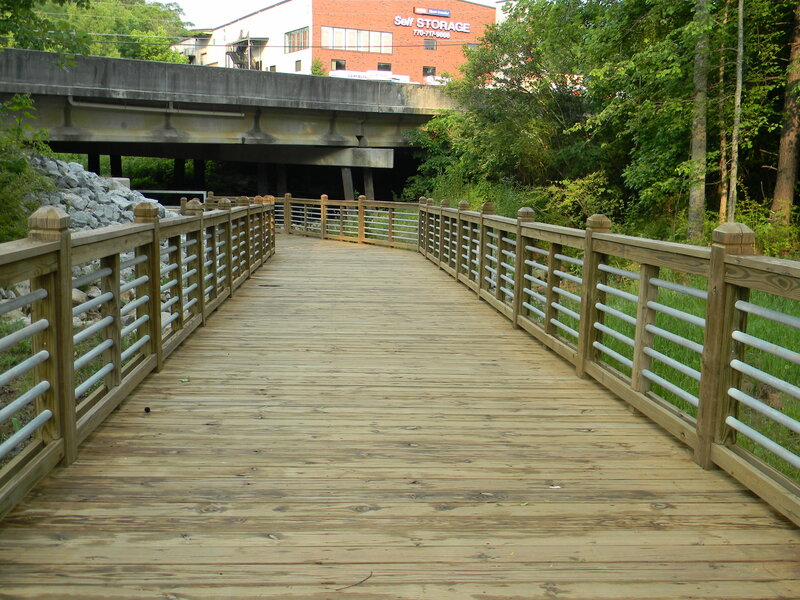 Not available until this year, the Lion’s Club Park Trail now feeds into the Greenway. 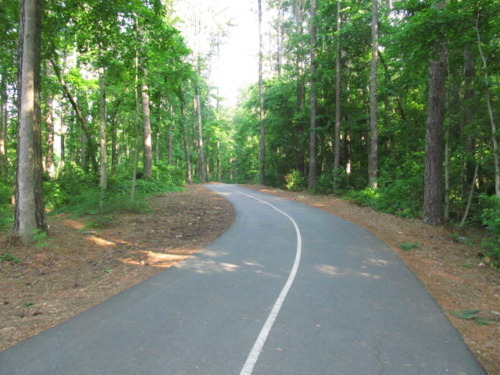 A potential long route is to loop around Lion’s Club Park onto the Greenway, through Lilburn Park, onto the Greenway offshoots and back, which is some nice mileage with a mix of scenery, inclines and flats. 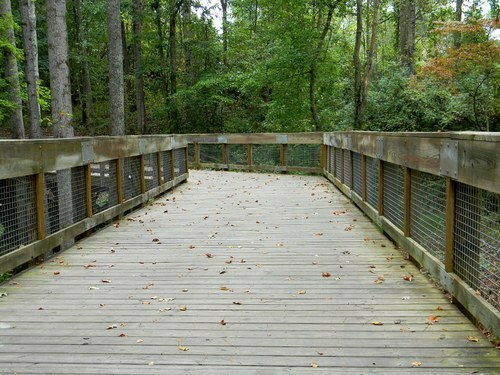 I chose a “tweener” route by taking one loop around Lion’s Club Park over to the Greenway, circling Lilburn Park and coming back to Lion’s Club which was a bit over 4 miles. 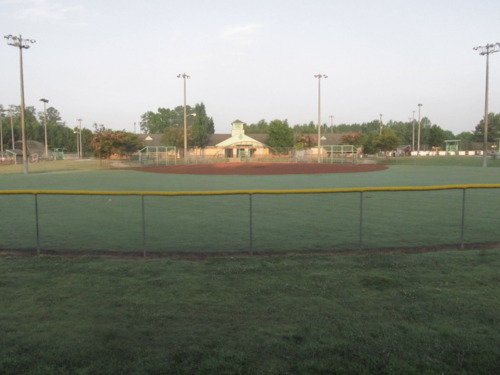 The new Lion’s Club Park is a great neighborhood park for families, fitness enthusiasts and baseball/softball fans with the bonus of a feeder trail system. 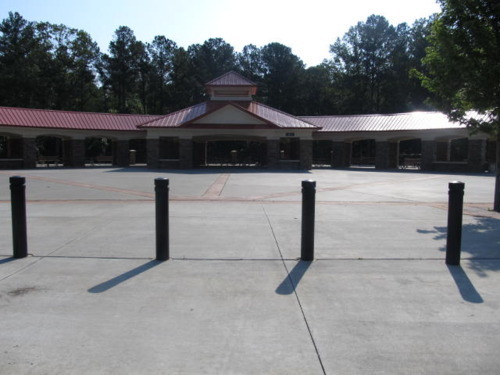 If you’re in the area or are from Lilburn and remember how the park was, you’ll be pleasantly surprised at what the park has become. 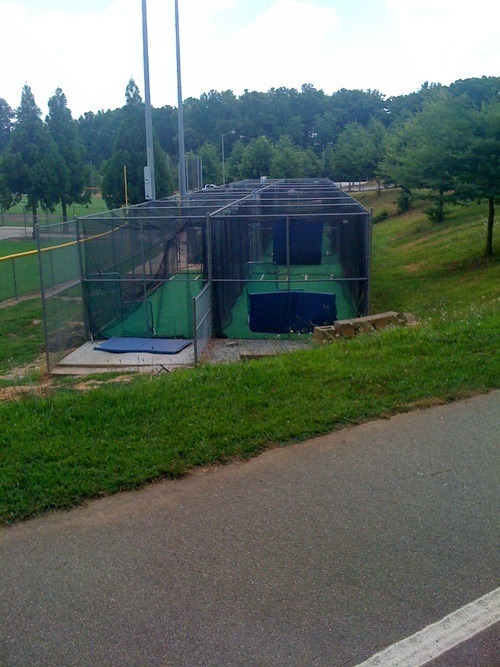 After the running FAIL at Peachtree Ridge Park, I didn’t rest until I had an opportunity to try another park. The destination this time, Rock Springs Park in Lawrenceville, Georgia. 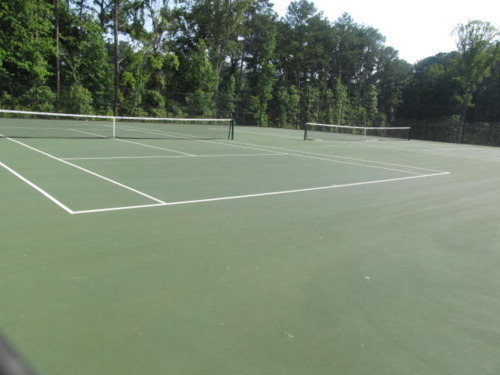 Per the Gwinnett Parks and Recreation website, Rock Springs Park features the following: 113 acres, football field with lighted walking track, six lighted tennis courts, playground, pavilion, restrooms, 2-mile paved, multi-purpose trail and grill. One thing of note that I’ve not seen at other parks is that there is a recycling bin in the lot near the pavilion and playground for bottles and cans, which is fantastic and I hope will get implemented in other county parks. Lady 2 proceeded to ask me if I wanted to leave a number just in case I had problems. I told her, no thank since my shoe is tagged with emergency information. I should have known after this conversation that this run would challenging, but the hard-headed runner had a score to settle. I wasn’t about to let another trail beat me. 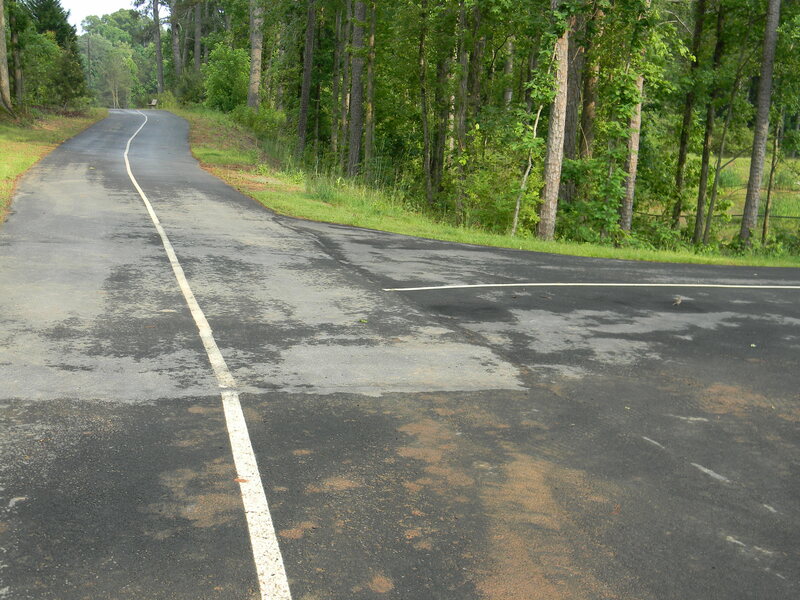 So I did my warm up (always a quarter mile walk) and headed straight uphill. Upon reaching the top I ran out of trail but ended up by the football field. Heading back was only a brief respite as the steepness going up meant I would be “putting on brakes” on the way down. Continuing on the downhill to my original starting point and beyond, was more of a downhill, back towards some water. There was plenty to view on the trail but not enough to make me forget about how hard it was. After few rough downhills it was time to make the ascent out. I don’t remember any normal breathing at all during the entire run which ended up at 3.25 miles. 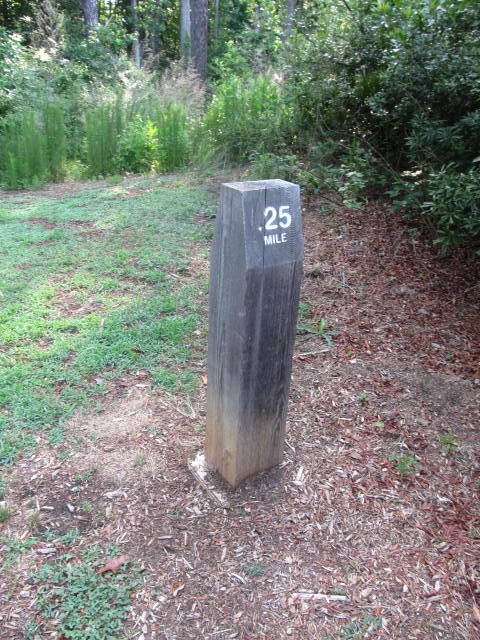 The website indicates the trail is 2 miles, it’s actually 2.25 starting from the football field entrance. Rock Springs Park is a great place for four things, children’s play (they have a really nice playground), tennis, football and of course the trail. Though this trail is really challenging, it’s a good test of fitness, that I’d recommend in anyone’s running or walking program. However to prevent entry I wouldn’t recommend it more than once a week. 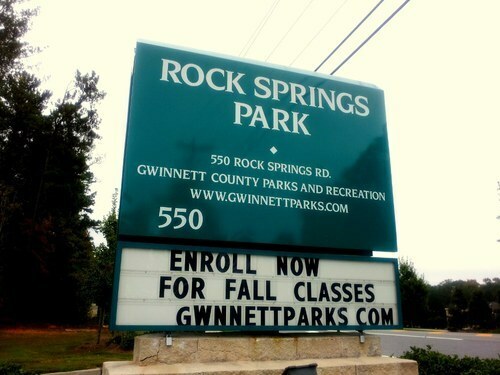 Fore more information on Rock Springs Park or other parks in Gwinnett County Georgia, please be sure to visit the Parks and Recreation website. Until next time see you on the trail. The day after Peachtree Road Race, I knew I had no strength to run (see why here) but could definitely go for a walk and check out another one of Gwinnett County’s (GA) finest. 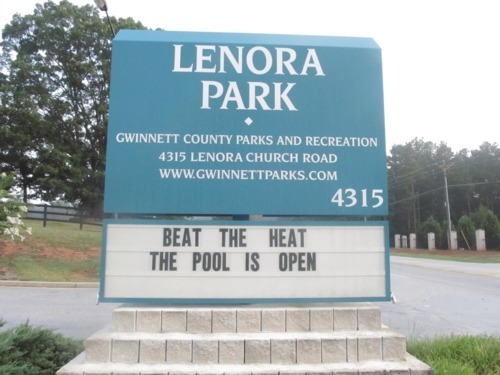 So I fired up the parks and rec map and Google maps and landed at Lenora Park in Snellville, GA.
Lenora Park in Snellville, GA has many of the features that residents and visitors come to expect in Gwinnett’s larger parks including: baseball/softball fields, a track, leisure pool, dog park, batting cages, gym, pavilion, children’s playground and disc golf. I didn’t know what this disc golf was until I came back on Saturday and saw it in action. There’s something for everybody in this park and the second visit revealed it in full use. For me though, it’s all about the trail. On Tuesday I walked it, really early around 7:00 am and walked it slow to take pictures and poke a round and what became crystal clear is that the paved trail is for EARLY MORNING or cooler weather use, unless you are the hearty type who can take the heat and humidity of the Dirty in July. 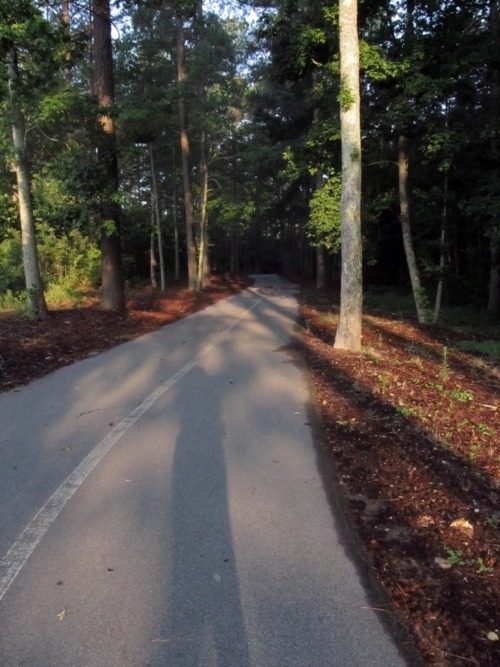 There are plenty of trees but for all but the back side of the park and a little piece on the Lenora Church Road side, runners, walkers and bikers get to enjoy plenty of wide open unshaded space in which to move. That aside, I love this trail. 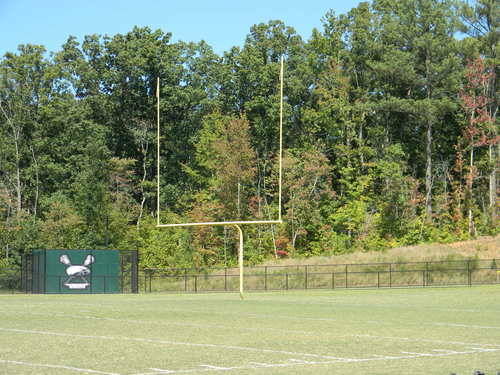 It is relatively flat and fast for all rabbits and is a nice break for turtles like me. 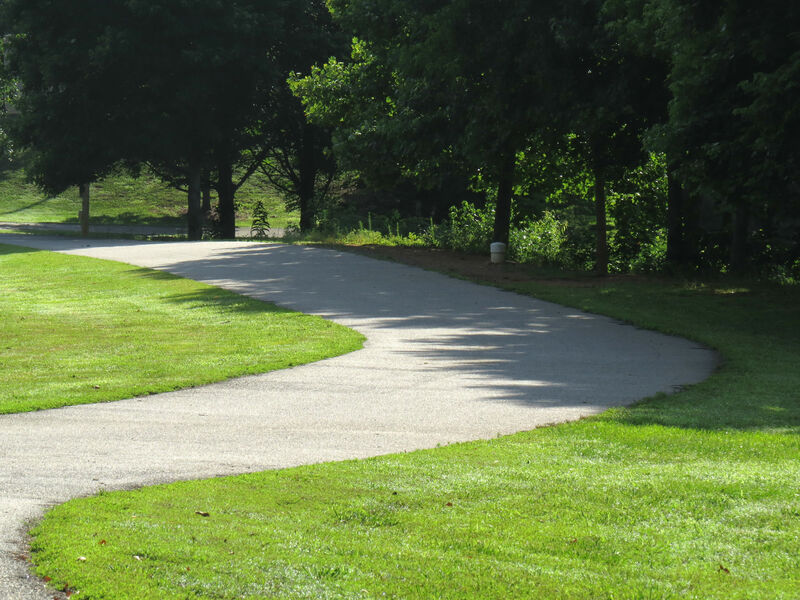 The paved trail is 1.7 miles which is fantastic with only three loops you’re at 5.1 miles and four loops puts you at 6.8. 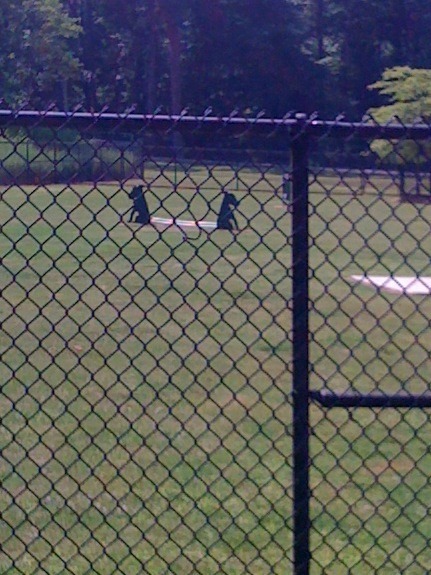 What was especially beautiful for me at this park is that on Saturday morning the park was full of black people. Since my folks have such high rates of obesity, heart disease and diabetes, I was really encouraged to see so many folks out there handling their health business. 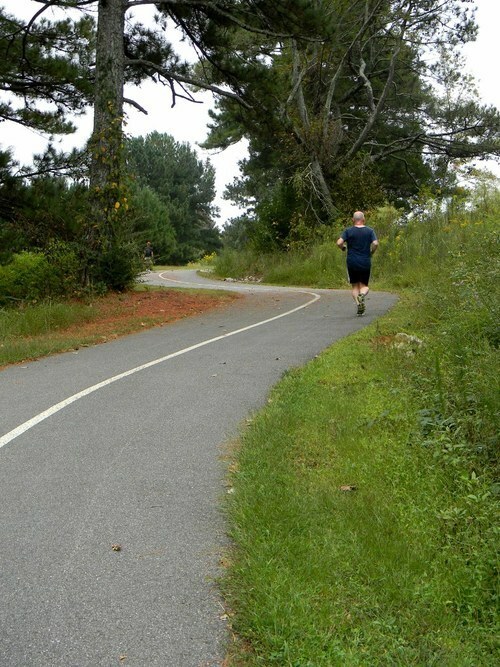 Lenora Park is great for runners, walkers and bikers with that fast trail and is great for more leisurely pursuits as well. If you’re in the area, check it out and if you’re not I encourage you to visit the parks near your home base. 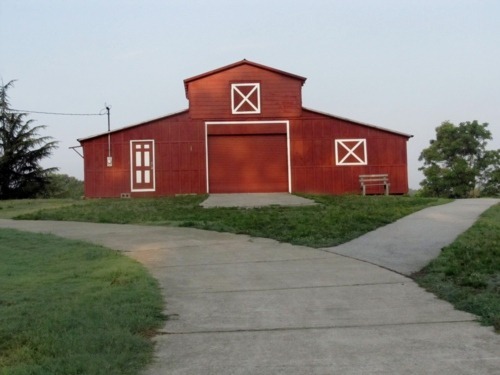 July is National Park and Recreation Month, why not grab your kids, running shoes, book or nothing at all and experience parks for yourself. 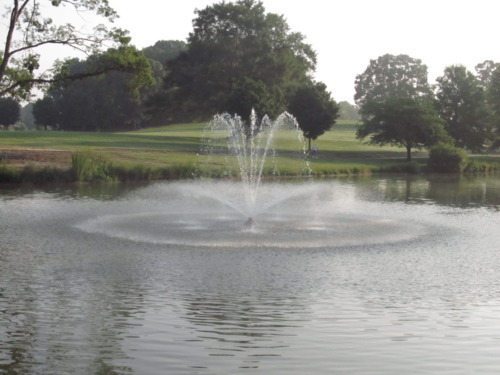 I’d just completed a run at my favorite spot, Bethesda Park on a weekday morning. In order to avoid traffic which was backed up I stayed on Bethesda Church road until it turned into Bethesda School Rd and lucky me, another park was in sight, Sweetwater Park. Having the day off and no schedule to follow I pulled into the lot to check it out. 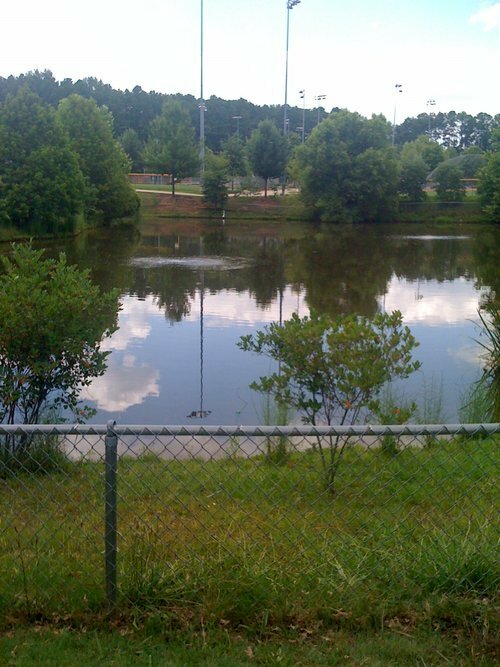 Sweetwater Park is a small but well maintained park in Lawrenceville, Georgia. 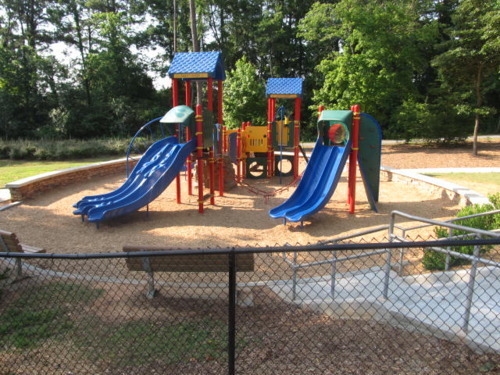 Features include a playground, pavilion, tennis courts, half-court basketball, and sand volleyball lot, something I’ve not seen at other Gwinnett Parks thus far. Having arrive around 10:00 am there were not a lot of people around including one staff guy on hand to clean up after a holiday weekend. 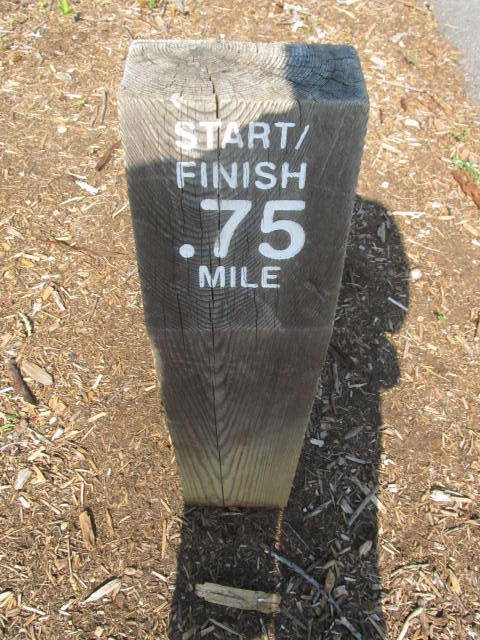 The trail was easily accessible, .75 miles long and not hilly. 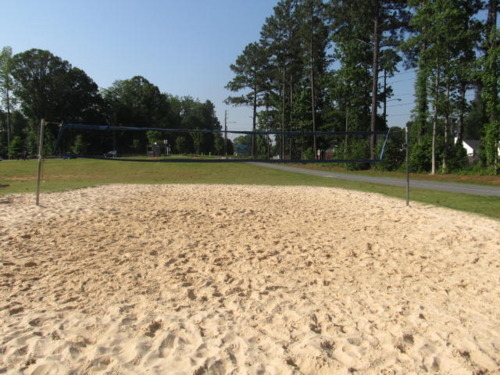 However, coming up on the volleyball side is an incline that will leave you slightly winded once you actually reach the sand. Beginning at the park entrance and going right, the trail is shaded for the better part of .5 miles, which is a nice reprieve when needed. Since the initial visit I’ve run at Sweetwater twice. The first time around 7:00 am which was really nice. There were only walkers and runners there and the .75 mile loop is perfect for a 3 mile run, four times around and you’re done. The Pavilion area is a nice for your cool-down, stretch, meditation and for watching personal trainers put clients through their paces. I went back a few weeks later around 7:00 pm and it was CROWDED. Walkers, runners, bikers, skaters, dogs and all of the courts including the sandlot volleyball were full, there was a girls basketball team doing drills and a boxing class at the pavilion. To top all that off, it was STILL 88 degrees. 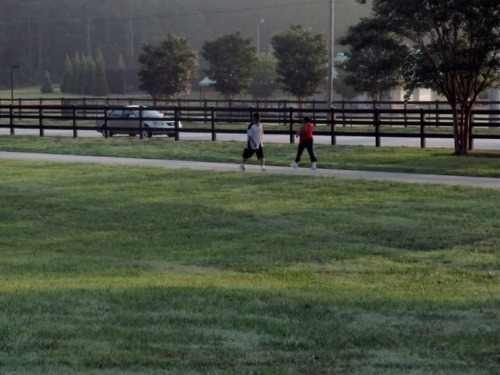 For runners and walkers Sweetwater Park is perfect for short distances, in the morning. For families and other sport enthusiasts the evenings are on and poppin! 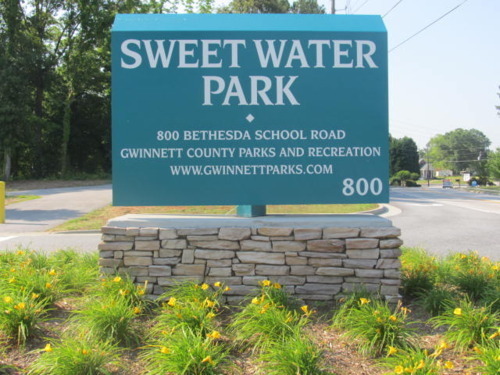 For more information on Sweetwater Park and others, go to the Gwinnett County Parks website. Hope to see you on the trail! 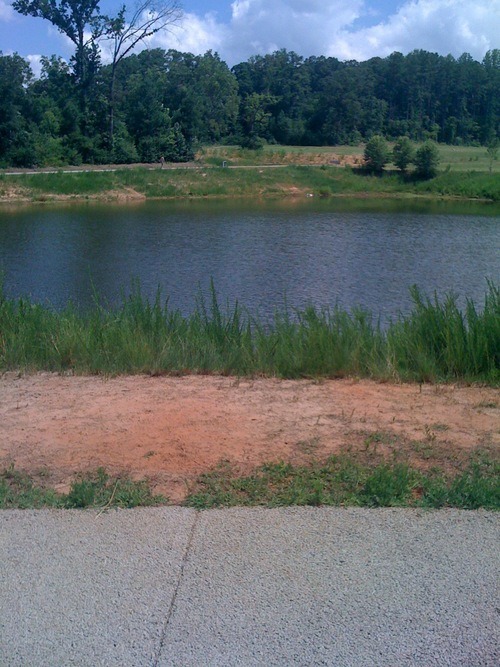 This is the park where the goose was found with an arrow in him. The goose was alive and was able to fly. 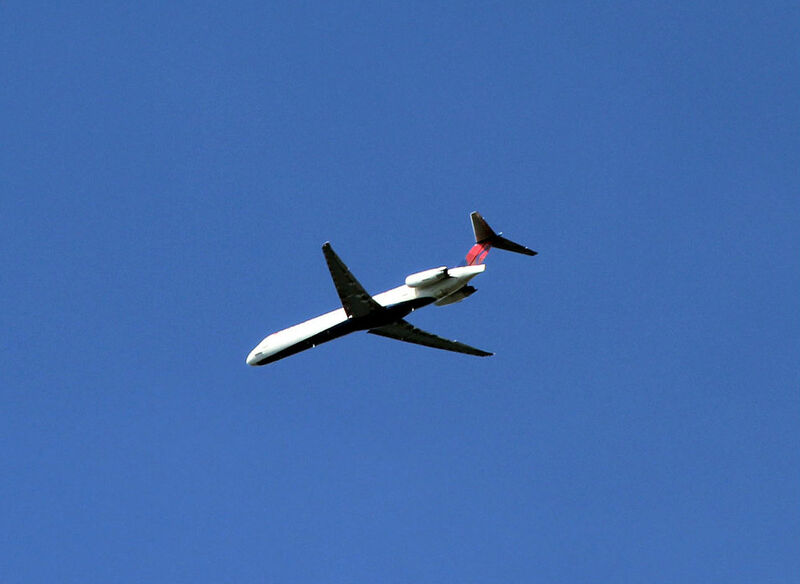 The arrow went through the tail feathers. WSB-TV showed the story on the 11:00 pm news about the arrowed goose, but it is not yet posted on its site. Trust I will be calling Parks and Rec in the morning. 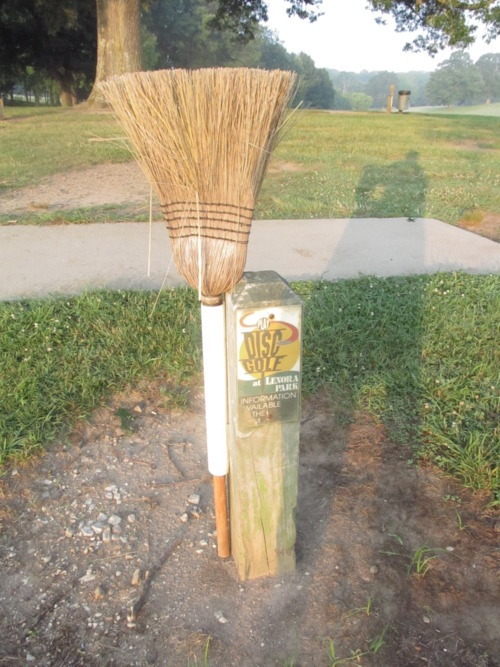 This parks post is a bit different out of necessity. 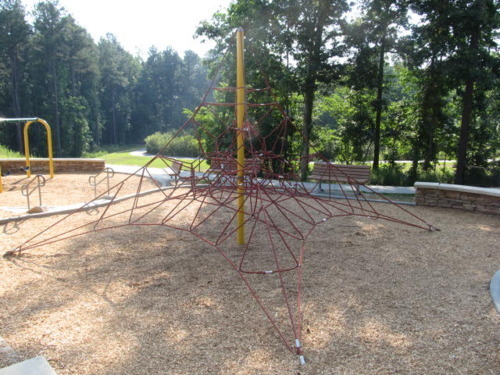 Mountain Park Park is located on Five Forks Trickum Road in Lilburn, GA and it has a LOT going on. 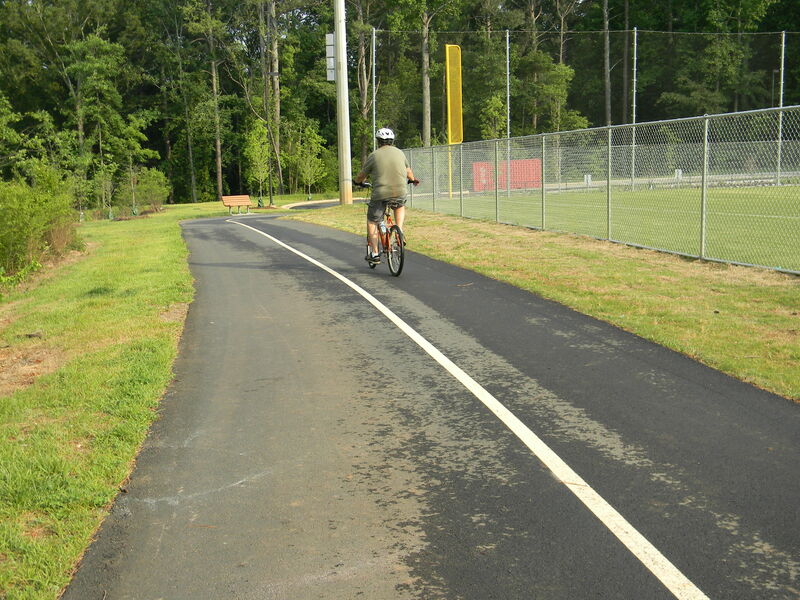 Baseball/softball fields, football field, lighted tennis courts, batting cage, grassy shaded areas, a skate park and a 1.0 mile pave trail. The trail runs close in to all the fields, so it might be a bit distracting for someone used to running on trails surrounded by trees. There are some trees on the back side and the trail is really most conducive for easy run days. I likely will not run in this park but will pull up in one of those grassy areas and read or chill or watch all the kids play. Having taken an extra day off during the holiday I went to these parks because I made a promise to myself to change up my routine a bit after Peachtree and run in some different parks throughout my county. Both Bethesda (visited on 7/5) and Graves (visited on 7/6) meet my criteria for good spots to run, enough hills, adequate shade, not too close to the other activities and so on. 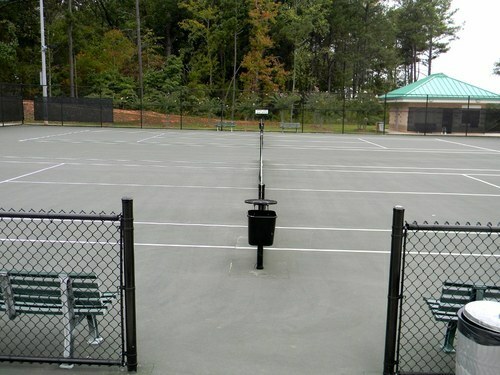 What I found most disappointing was the discrepancy in the maintenance of these parks. Both Bethesda and Mountain Park were clean, trash bins empty and doodie bags (for dogs) stocked appropriately throughout the park. Graves Park on the other hand had some trash on the side of the trail, the trash bins were full and there were no doodie bags in the stations along the route. Norcross, in which Graves Park resides is in a majority Latino area. So my mind really started racing at the point. Instead of flying off the deep end altogether I contacted the Parks department to find out why the other parks were clean and this particular park was not and was told that the supervisor for that area was out as a result of an accident. Now, the supervisor generally is not the one who cleans the park there are work crews that do this. Even after the holiday it’s highly unlikely that not every single one of the work crews was off, which means the parks still should have trash picked up. Besides, is there not some sort of contingency plan for when people are out so that the work continues? It’s all too fishy for me, because even ignoring the trash problem, there is still an element of maintenance in terms of weeds and grass and overgrowth in Graves that was not present in the other parks visited. 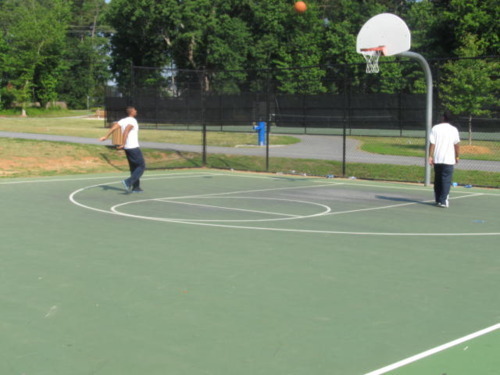 So the question in my mind is, is there willful neglect of parks that serve minority areas and those that do not? 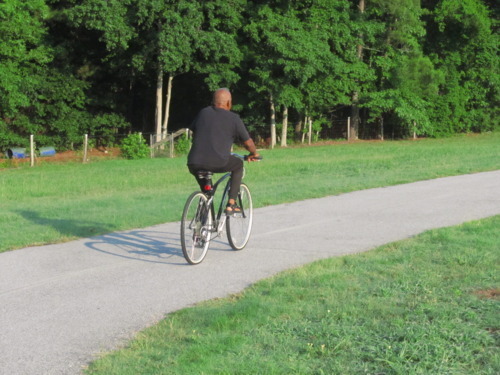 I’ll be returning to the park to see next week and will be checking out more of the parks in the more heavily populated minority areas in the county. My desire is to be presently surprised to find them all in pristine condition. My expectation however is that they won’t be. Gwinnett County on the whole is a “majority minority” county but there are pockets where this is not the case. If I find maintenance to be equitable, I’ll let it rest, if not I’ll be calling for back up. Like a two-year-old smoking a blunt.